Roast Chinese chicken thighs, rice and salad | What's for dinner? It’s National Barbecue Week and it’s a beautiful sunny day in South Wales – even if I have spent most of it poring over a case study for my upcoming exam. We live in second floor flat, which you can imagine has limited outdoor cooking facilities, so I was glad to find this BBC Good Food recipe which has a delicious barbecue flavour but is easily done under the grill. As with so many barbecue recipes, the key to this is in the marinade, which I let steep for two hours. The lemon, soy, ginger, garlic, sugar and five-spice are all pretty strong flavours, but they work well together. I changed the recipe slightly to let the chicken roast for the first quarter of an hour before browning under the grill. 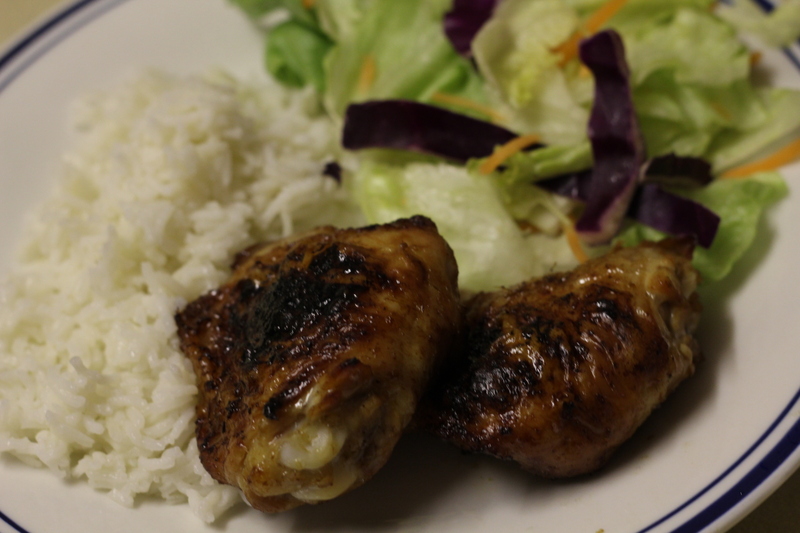 The chicken thighs were so tender and juicy that all they needed was some basmati rice and a crunchy salad with a drizzle of lemon.